Chinese internet Baidu is widely credited for being one of the first to dive deep into artificial intelligence, hiring Coursera co-founder Andrew Ng (who has since departed) to lead its efforts back in 2014. Surprisingly, then, it has taken the company until today to release its own smart home products. But, far from another identikit contender, they stand out for being quite unlike anything you’ve seen from a major name. Baidu used its annual Baidu World event to unveil a smart speaker and two smart speaker/mini robots for the home. The devices are powered by the firm’s DuerOS voice platform and are the work of Raven, the startup Baidu acquired earlier this year, and its Swedish partner Teenage Engineering, which is known for pushing the envelope on hardware design. Baidu has certainly delivered something that looks unique in the increasingly crowded smart home market. Its Raven H looks nothing like an Amazon Echo, Google Home or efforts from Chinese rivals Xiaomi and Alibaba. In fact, it barely resembles a speaker at all in the conventional sense. The Raven H looks like a stack of plastic squares, the top one of which is removable. There’s an LED touch screen controller that can be detached from its position at the base of the stack to use as a voice-based remote that connects with Baidu-Raven’s series of home devices. The device goes on sale next month in China where it will cost RMB 1,699 ($256). Already InterContinental Hotels Group is working to equip its Beijing Sanlitun hotel with the speakers. There’s no word on international launch plans, but Teenage Engineering told Engadget that it aspires to sell the product outside of China in the future. Baidu’s two home robots are also part of today’s news, but neither is ready for sale yet. The most developed is the Raven R, which looks like it belongs in a science lab. 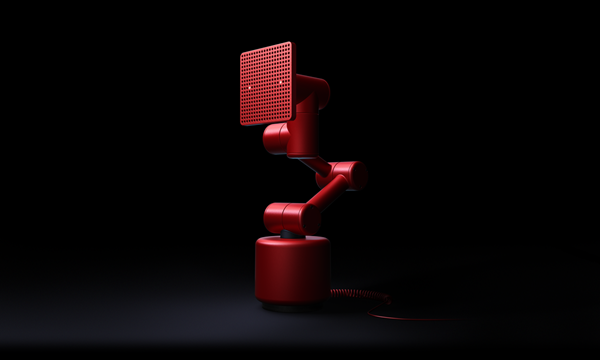 The robot includes six joints which allow it to move based on commands from its user and “express emotions to enhance the interactive experience.” That’s in addition to the basic speaker functions that you’ll find in the Raven H.
There’s no pricing or estimated launch date for either robot, but Cheng Lyu — the founder of Raven who now heads up Baidu’s Intelligent Hardware Unit — described them as a glimpse of what is to come. “These smart speakers and AI home robot may sound like a small step in the history of technology — but they will help people’s everyday lives and bring them an experience once only seen in sci-fi movies,” Lyu said in a statement.